A national group of prominent GOP donors is increasing its lobbying efforts in support of gay marriage. 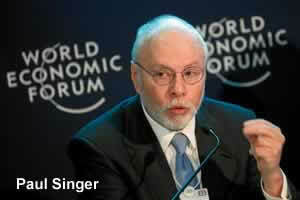 American Unity PAC launched last year with an initial $1 million donation from hedge fund manager Paul Singer. The Super PAC's mission is to encourage Republican candidates to support marriage equality by lending financial support. Its new lobbying organization, American Unity Fund, has already spent more than $250,000 in Minnesota, where a marriage bill has cleared House and Senate panels and awaits floor action in both chambers. The group has spend $500,000 on lobbying since last month in Rhode Island, Delaware, Indiana, West Virginia and Utah, the AP reported. “What you have is this network of influential Republicans who really want to see the party embrace the freedom to marry, and believe it's not only the right thing for the country but also good politics,” spokesman Jeff Cook-McCormac said. Singer, who is straight but has a gay son who married his husband in Massachusetts, the first state to legalize gay nuptials, is considered among the most important Republican donors nationwide. He has given nearly $10 million of his own money toward efforts to legalize such unions in New York, New Hampshire and New Jersey.